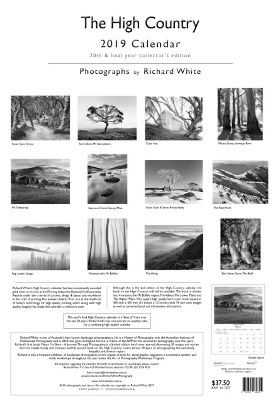 Contact the studio directly at richard@richardwhite.com.au if you are desperate for a copy! This will be the final edition of my long running High Country Calendar. The twentieth offering. The final calendar is a best of from the last 20 years. The calendar measures 495mm x 340mm, spiral bound at the top, printed single sided with large black and white images. This year's calendar will cost $37.50. Post and packing is $11.50 per calendar and $6 for each additional calendar. 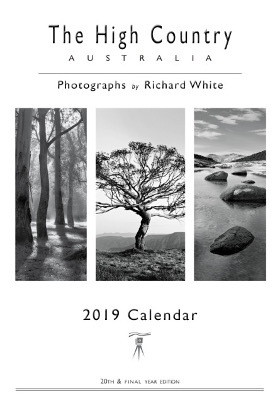 If you would like to order without PayPal you can pay by EFT to BSB 033240 Acc# 113697 with Surname & CAL, then send an email to richard@richardwhite.com.au with your details. Unfortunately Paypal no longer allows shipping to P.O. Boxes. However, if you would like to ship to a P.O. Box, enter your P.O. Box address in the special instructions area on PayPal.